Since a couple of weeks ago, I’ve been hearing more and more about Shomi books (Book Binge has had a Spotlight series on Shomi the past month). I had been meaning to blog about them for a while and then this contest came along, giving me the perfect opportunity to do so. All I have to do, is pimp the contest on my blog (check, done that) and show which Shomi books I’d like to read in the future. So what exactly are Shomi books? They’re a new line of speculative romance books from Dorchester, all not bound to the rules of our reality. 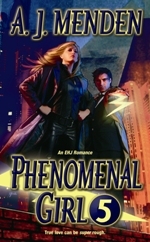 Some of them are futuristic, some time-travel, some paranormal. It’s a great mix of a different kind of romance novel. So far there are 9 books out and two coming out in the next two months. A romance novel with a plot most similar to Cube and Saw? Interesting (sometimes I wish I could embed voices into this text. That ‘Interesting’ definitely had a mad Transylvanian scientist accent to it.) Set on a post-plague Earth, Kira Jordan is a thief with a wicked sense of humour. The book starts with her waking up, handcuffed to a wall in the dark. And she’s not alone. Chained to the opposite wall, is the convicted mass murderer, Rogan Ellis. 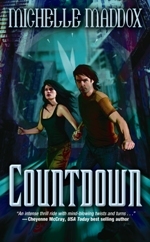 With only 60 seconds to escape, Kira is forced to work with him, if she ever wants to make it out of there alive. I’m not completely sure what the setting of this book is. It seems to be a paranormal/other dimension type of story. Skye Brown is a normal girl in New York, with everything she wants: a cool job, a boyfriend, a great apartment. But at night she has weird dreams. Of a post-apocalyptic world with a bleak futuristic wasteland. 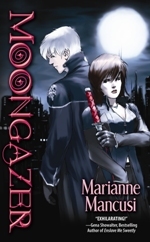 In them, she’s not Skye, but Mariah Quinn, a Moongazer. It sounds kind of fun, right? Is it another world? Are they messages from the future? I can’t wait to get my hands on this. If it wasn’t for the Book Binge’s spotlight, I most probably would have ignored this book completely. Lainey is Phenomenal Girl 5, a superhero with great strength and the ability to fly. She’s just been made a member of the Elite Hands of Justice, but before she can go on active duty, she’ll have to complete her training with one of the toughest superheroes around: the Reincarnist. It sounds a bit cheesy, but after reading an excerpt Book Binge posted, I just knew I had to put this on my To Read list. Check out the Shomi website to see all the books (and excerpts). If you want to read reviews about some of the books, the Book Binge blog has got some interesting ones.